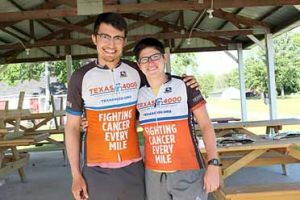 University of Texas students, called Texas 4000, are taking part in a 70-day ride from Austin Texas to Anchorage, Alaska. The students arrived in Aitkin July 2 after cycling from St. Cloud. The biker’s main objective is to fight cancer by raising funds and to increase awareness of the disease. After one night in Aitkin, they headed toward the Canadian border on their way to Alaska. Reid O’Conor and Vanessa Beltrand, said the students raised $580,000 over 18 months to fight cancer. Most of the money will go to MD Anderson Cancer Research Center in Houston, Texas. Noting the large amount of funds raised, Beltrand said, “People really want to help in the fight against cancer.